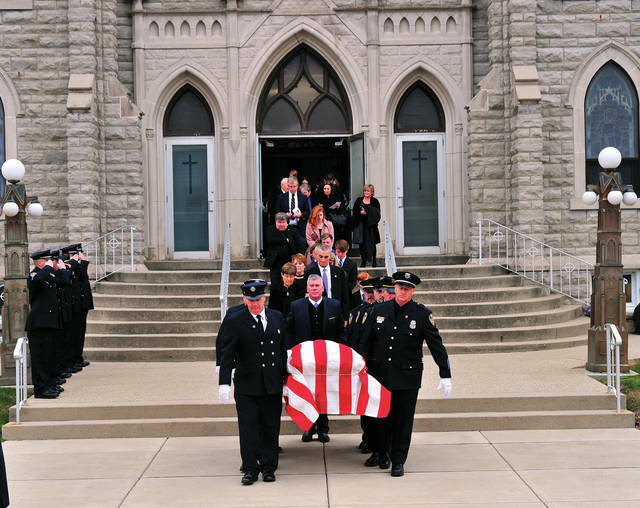 Mike Ullery | Troy Daily News Pall bearers and an honor guard made up of Troy police and firefighters leave St. Patrick’s Catholic Church on Wednesday following a Mass of Christian Burial for longtime Troy Mayor Peter E. Jenkins. 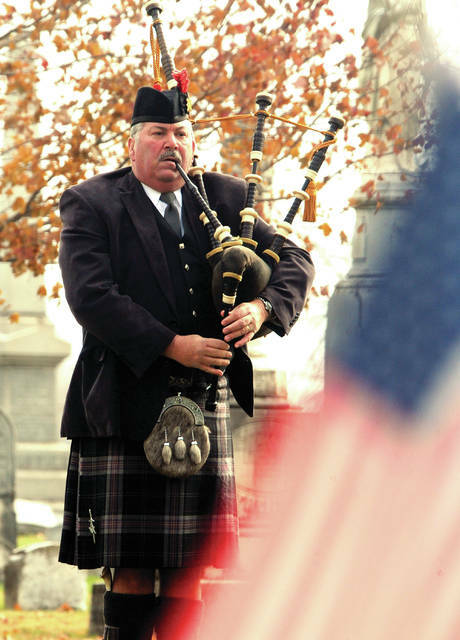 Mike Ullery | Troy Daily News Piper Del Braund plays “Amazing Grace” during Wednesday’s funeral at Riverside Cemetery for longtime Troy Mayor Peter E. Jenkins. 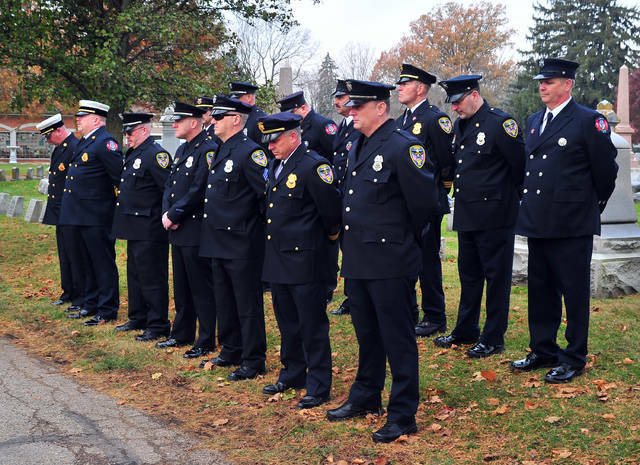 Mike Ullery | Troy Daily News An honor guard of Troy firefighters and police officers salutes during the playing of “Taps” at the graveside service for former Troy Mayor Pete Jenkins at Riverside Cemetery on Wednesday. 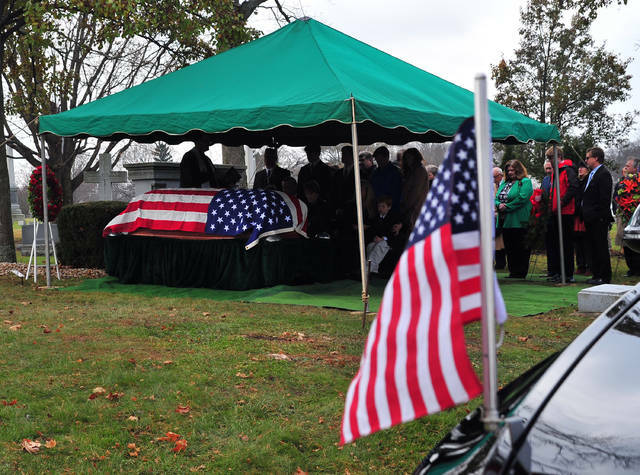 TROY — Former Troy Mayor Peter E. Jenkins, widely known about town as “Mayor Pete,” was laid to rest in Riverside Cemetery on Wednesday following a service at his home church, St. Patrick’s Catholic Church. Jenkins, 84, passed away Wednesday, Nov. 14, following a lengthy illness. 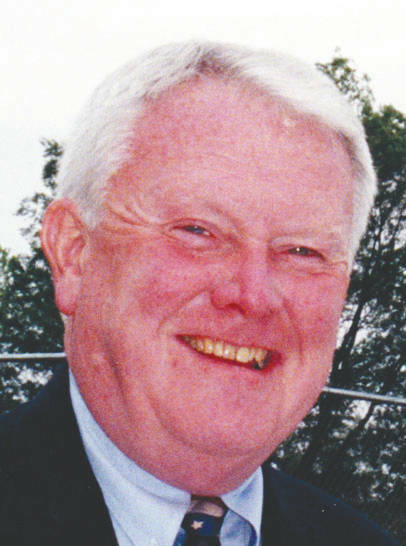 A veteran, Jenkins was elected as a Troy City councilman in 1978 and served as its president from 1983-1992. He then became mayor in 1992, serving in that capacity until 2003. He is survived by his wife of 60 years, Ruth Aileen Bodenmiller Jenkins; son, David Clayton Jenkins (Matthew Bennett) of Studio City, Calif.; daughter, Mary Elizabeth (Robb) Barker of Richardson, Texas; and daughter, Julia Diane (Chris) Melle of Dallas, Texas. Readings and gifts during the service were presented by his five grandchildren. During the service, his son David remembered his dad for his love of family and community, saying the family always knew they had to share him with the residents of his beloved city of Troy. One common theme in all aspects of her father’s life was kindness, his daughter Mary recalled. Mary gave many examples of her father’s kindness through stories she had heard in the days since his passing. She said friends and community members had reminisced about his helpfulness to people throughout the city of Troy, a place she said he loved so much. In relation to her father, Mary shared her appreciation for his genuine interest and his ability to relate to others. It’s where you didn’t see him that Julia said made their family the most proud. 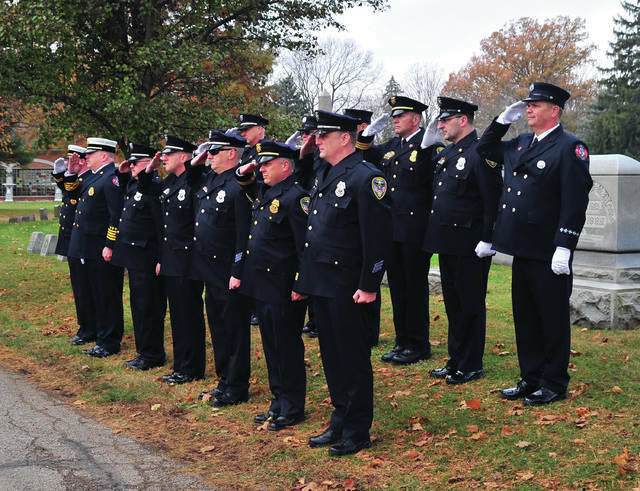 https://www.dailycall.com/wp-content/uploads/sites/30/2018/11/web1_112118mju_funeral_petejenkins1.jpgMike Ullery | Troy Daily News Pall bearers and an honor guard made up of Troy police and firefighters leave St. Patrick’s Catholic Church on Wednesday following a Mass of Christian Burial for longtime Troy Mayor Peter E. Jenkins. https://www.dailycall.com/wp-content/uploads/sites/30/2018/11/web1_112118mju_funeral_petejenkins2.jpgMike Ullery | Troy Daily News Piper Del Braund plays “Amazing Grace” during Wednesday’s funeral at Riverside Cemetery for longtime Troy Mayor Peter E. Jenkins. 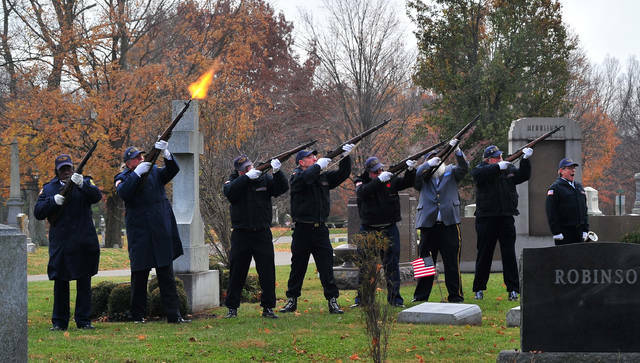 https://www.dailycall.com/wp-content/uploads/sites/30/2018/11/web1_MU2_5090.jpgMike Ullery | Troy Daily News An honor guard of Troy firefighters and police officers salutes during the playing of “Taps” at the graveside service for former Troy Mayor Pete Jenkins at Riverside Cemetery on Wednesday.